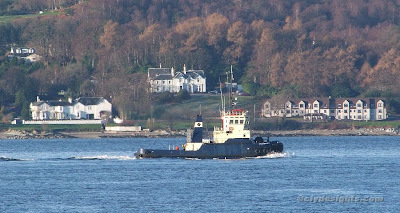 Seen this morning out and about on the Upper Firth, the tug WILLOWGARTH appeared to be running trials following her recent stay in the James Watt Dock. Sailing downfirth as far as Toward, she turned round and headed back up the firth, into Loch Long and to the oil terminal at Finnart. She later returned to Greenock. WILLOWGARTH, which dates from 1989, is usually based at Belfast.